Monster truck excitement... at home! 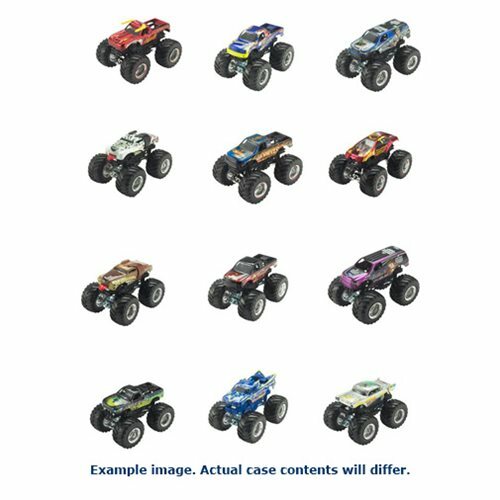 Case includes 12 Monster Jam trucks! Collect all 80 different trucks in the line! Authentic, licensed Monster Jam trucks from the world's biggest monster truck circuit! These 1:64 scale trucks in this Hot Wheels Monster Jam 1:64 Scale 2017 Wave 4 Case (977E) feature die-cast metal bodies, and oversized tires with chrome-like rims. An awesome range of truck styles ensures variety throughout the year for kids and collectors alike. Not for use with some Hot Wheels sets. Ages 3 and up.